GBB, under subcontract to NTH Associates, prepared RFP and contract documents for the City of Pontiac, Michigan that were used to procure the following solid waste services: Lease and Operations of the City Landfill under an aggressive schedule set by the City, Collection and Disposal of Curbside Refuse, Yard Waste, Bulk Waste, Refuse from City-owned Facilities, Commercial/Apartment, and Right-of-Way Violation Abatement; Collection and Marketing of Drop-Off Centers Recyclables; Waste Transfer; Compost Site Operations; and Purchase of Airspace. 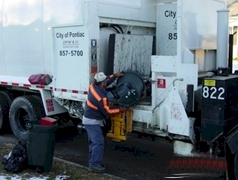 GBB helped the City evaluate its needs, identify strategies and plan improved waste and recyclables management, resulting in lower costs to waste generators and increased revenues to the City. GBB assisted with an internal workshop, which included senior City management and City Council members. GBB helped the City evaluate proposals and negotiate a long-term agreement with the contractor. The City will realize significant savings over its current system costs, including City-provided and contractor-provided services and will realize substantial revenues in the form of upfront payments, facility rentals, and host fees on guaranteed contractor tonnage that escalate over the term of contract.